All Thai massage books available by Thai Massage Book Press are the actual text books and manual used in Thai massage classes at Thai Massage School of Chiang Mai and Thai Massage School of Thailand. Ancient Golden Wisdom in Thai Massage presented by founders of awarded Thai massage schools in Thailand on how to integrate Thai massage healing with the true force in us – Prana or Life Force. 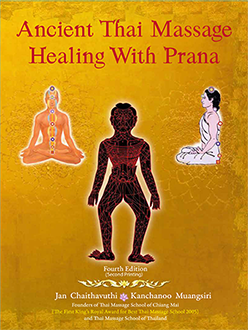 This book is for sale together with Ancient Thai Massage Healing with Prana: Fourth Edition. The Foundation of Thai Massage Applied on Table: Level 1 Plus is the step by step hands on manual of how to perform Thai massage on a massage able safely, effective and gracefully. The most comprehensive hands on manual for Thai foot reflexology. The demonstrations performed by the teachers following Thai Massage School of Chiang Mai’s curriculum. This is the manual of techniques taught at Thai Massage School of Chiang Mai (TMC). The simplest way to apply Thai massage for the back using a chair in seated position. Thai massage is to promote good health. Health is not only a matter of absence of diseases, but it means total well-being, physically, mentally, socially and spiritually. When you feel well, it is because your being is well balanced. Ill feeling of any kind occurs from loss of balanced, be it of any dimension. Thai massage promotes and restores balance of your system, body and mind as well as social and spiritual. Massaging releases muscles from their mounted tension which causes pain and discomfort, leading to relaxation, feeling of happiness and even bliss. Researches have shown lowering of blood pressure and tranquility associated with massaging. And no wonder why people fall asleep while being massaged. There is a social dimension during massage. Compassion and goodwill of the care givers, as well as the politeness and the respectful touching, uplift the spirit of the people being cared for. It enhances faith in goodness. In reality every human being has a seed of goodness buried deep in the heart. Prevailing materialism in the world masks the seed from growing. Massaging with compassion and goodwill will set the seed free to grow into goodness trees that cool the world. Professor Prawase Wasi, M.D., Ph.D.
Professors Prawase Wasi received numeral national and international awards. He is not only awarded a National Outstanding Person and National Outstanding Researcher awards of Thailand, but also honored by Thais to be the Noble Man of the country. Thai people know him as a kind, honest and intellectual citizen that when he speaks, people listen, what he writes, people read and follow. He founded numbers of foundations and organizations to improve lives and wellbeing of mankind and to lead the country to the right direction. His involvement in alternative and Thai Traditional Medicine set up momentum from Folk Doctor Foundation to National Health Foundation, and the most impact to Thai Massage is his work as a chairman of the historical Thai Massage Revival Project in 1985. Professor Wasi continues to be active in writing and working toward the goodness of the country and humanity. A portion of the proceeds from the sale of these books will go toward supporting special children education via TMC school management under long term support.